Amy has been our full-time receptionist since 2003. She is a Phoenix native and graduated from Moon Valley High School in 2002. Amy strives for excellent client and patient care. Amy is an amazing person and we compare her to an air traffic controller who keeps everyone running smoothly! You and your pet will be in good hands from the moment you walk in the door. Naya is quiet, polite, and our patients really take to her. Adrienne has been a great addition. She graduated with degree in Veterinary Assisting from Carrignton College. Adrienne has a passion for dentistry. Kristin is an excellent addition to our hospital. She greets every patient with enthusiasm, especially if it is a Golden Retriever. 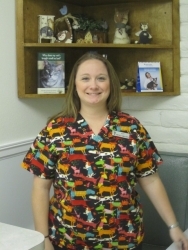 While you are here for your visit, Kristin will take great care of you and your furry friend.